Distribution and habitat: Tacca chantrieri grow wild in the tropical forest from the regions of West Africa and Southeast Asia, where they can get as tall as 90cm (35 inch). Most of these oddities thrive on the moist soils of the forest floor in well-drained soil and high humidity. Description: Tacca chantrieri is a clump forming herbaceous perennial bearing exotic, log stemmed flowers. It grows from an underground rhizomes. The kinds in cultivation have creeping rhizomes or rootstocks and large, oval, crinkly foliage. Reaching lengths of up to 38cm (15 inch) broad, 20cm (8 inch) wide, the smooth, lanceolate leaves, with angular pleats, are dark green with an under surface colour of greyish green. The flowers are black and up to 30cm (12 inch) across. Curious plant with up to 25 flowers on bat-like (both in shape and color) inflorescences, where each umbel has a pair of large spreading, wing-like rich maroon-black bracts. The four large black bracts look almost like bat wings with long 10cm (4 inch) threadlike tails extending from the tip of each of the flower petals, leading to another of its common names, ‘Cat’s Whiskers Plant’. 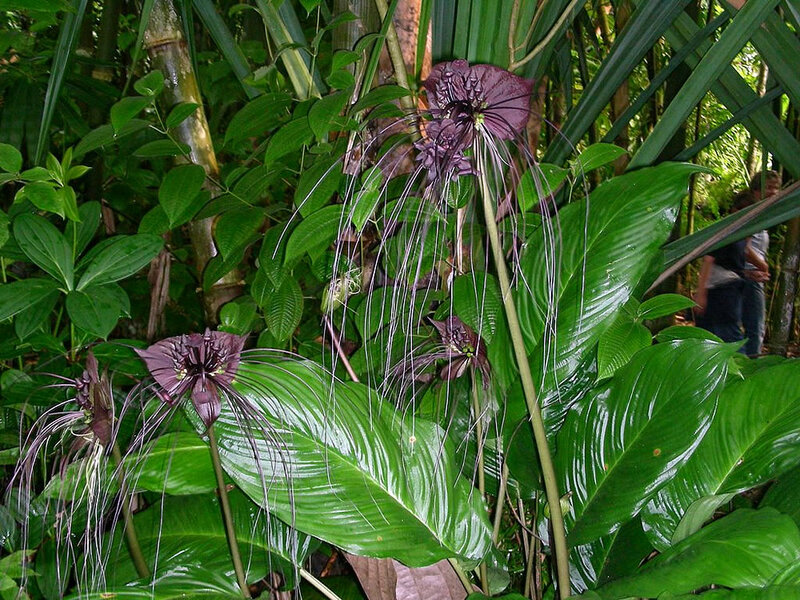 The bracts are accompanied by 25cm (10 inch) long trailing filaments or “whiskers” forming a flowing forked tail, which emanate from the nearly black with some purple, flower scape. The scapes (flower stem from the base of plant to where the flower actually is) are about 63cm (24 inch) long. The small black 5 petals flowers are succeeded by heavy berries. They bloom mainly during the summer once they reach 2 to 3 years old. Flowering seems to begin when the plants have produced 2-3 full-size leaves. Each plant produces at least 6 and up to 12 flower stems during the warm months of the year. Each flower lifespan is five to seven weeks. After the plant blooms, it will develop seed pods. 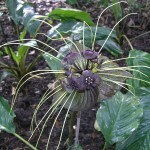 Tacca chantrieri is capable of setting seed without pollinators. Seed pods will remain on the plant for quite a long time. The leathery capsules (about 4cm (1.5 inch) long) require up to a year to ripen. Houseplant care: When Tacca chantrieri like the conditions, they grow, flower a lot and even produce offsets. When something is not right, they slowly decline and eventually die. Unfortunately, sometimes the only way to know if you can provide them the right conditions is by trying. Large plants seem to do better than smaller ones. However they grow fast and flower a lot when the conditions are just right. Tacca chantrieri plants are evergreen but they have a rest or dormancy period. Because they are not from a place which freezes, therefore during their dormancy, they retain their foliage, they simply stop growing. Flower stalks may be staked to best display the blossoms. Light: This plant loves medium to bright (indirect) light. Avoid direct sunlight as it will scald the thin leaves. It prefers at least 4 hours of bright indirect sunlight a day. The light is an important factor to promote the bloom of these plants. Set the plant in an east- or south-facing window where it receives bright, indirect light. Temperature: Provide to Tacca chantrieri plant a temperature of 25-29°C (77-84°F) through the summer and 15-18°C (59-64°F) through the winter. These plants will prefer daily temperatures of 3-8°C (5-15°F) higher than night temperatures. Humidity is essential for this plant survival. Tacca chantrieri plant needs moderate to high, preferably 50-70% relative humidity. Elevate the humidity by using a humidifier, grouping plants or using humidity trays. Never mist in low humidity settings as the misting actually opens the plant pores, which causes the leaves to transpire out more moisture than the misting supplied, eventually resulting in a dead plant. Watering: During the growing season (late spring to late summer) the plants will need frequent watering to keep the potting mixture evenly moist. Water with warm tap water until the excess drains from the bottom. Use a pot with a drainage hole and drain the excess water from the drip tray to prevent soggy soil which will cause the rhizomes to rot. Allow to dry down a bit more during the winter resting period. Keep the potting mixture just barely moist until the plant resumes growth in spring. Feeding: Feed every two weeks with a liquid fertiliser or orchid fertiliser diluted by half while plant is growing and flowering. Do not fertilise during the rest period. Potting and repotting: Unlike many others rhizomatous plants, Tacca chantrieri plants do not like to be crowded (to be root-bound) and appreciate a wider, shallow pot. Repot them every year in early spring when the growth is active. Never repot a blooming plant of any kind. This is a good time to divide rhizomes and pot them separately. Typically this plant can be grown in a 15cm (6 inch), 20cm (8 inch) or 25cm (10 inch) pot. When the maximum pot size was reached – 25cm (10 inch) -, wash the soil, cut most of the roots off and remove most of the leaves. Remove and pot separately the offsets and repot the old plant in the same pot cleaned and filled with fresh soil. The soil is one of the most important things for success with these plants. The mixture needs to be light, very porous and something that drains well. Use something like: 60% peat moss, 30% perlite and 10% vermiculite or use a potting soil mix designed for orchids. During repotting, add controlled-release fertilizer pellets to the potting mixture. Avoid tamping the soil too much. Water to get the soil to settle around the roots and let it drain away. Put the transplant in low to medium light and allow to harden off for about 8 weeks before moving to a brighter location. Gardening: These frost-tender plants can be grown outdoors in tropics and subtropics, but elsewhere require the protection of a greenhouse during the winter months, as frosty conditions will inevitably kill this very delicate plant. Potted plants are easy to be moved in a sheltered location during winter season. Never pot up unless there are still 2-3 months of warm weather as in winter these plants go dormant. Tacca chantrieri is not particularly demanding once it is given everything it needs to succeed, humidity and protection from strong winds. When they like the conditions, they grow, flower a lot and even produce seeds, otherwise they slowly decline and eventually die. If you grow the Tacca chantrieri outdoors, cover it with a bucket when outdoor temperatures will or may drop below 13°C (55°F). Also, they do not like too much heat or air that is too dry. Location: Tacca chantrieri like shade and good air circulation. The plants thrive in 70-80% shade. This plant should be planted in partial shade and in a humid and warm environment. Soil: The soil is one of the most important things for success with these plants. The mixture needs to be light, very porous and with excellent drainage properties as Tacca chantrieri will not tolerate wet soil at their roots. When plant these plants outside in the garden, the soil should be acidic, fertile and rich in organic matter with a loamy to sandy consistency. These plants require a soil ph of 6.1-7.5 meaning it does best in weakly acidic to weakly alkaline soil. Alkaline soils will cause the leaves to turn yellow. Irrigation: Plants should be watered on a regular schedule. Care must be taken to not allow soil to remain soggy or to dry as the plant wilts. Stress of wilting will inhibit flower production. Watering should be done through the spaces of the leaves, as well as directly on to the compost. Fertilise: Give these plants a good dose of fertiliser on a regular basis from late spring through mid autumn. 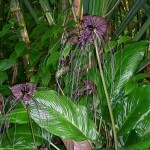 Tacca chantrieri tolerates most commercial plant fertilizers and organic composts. Do not fertilise them during the rest period. Propagation: Tacca chantrieri can be propagated by dividing rhizomes (including offsets) or by seed. The rhizomes can be divided at repotting time in the spring. Make sure each rhizome section contains a bud. Plant the rizhomes in a pots that are at least 15cm (6 inch) wide – one piece per pot. Use recommended potting mixture for mature plants. Plant the rhizome upright. Let 1/8 of the rhizome show above the soil when starting. Add compost as the plant grows in the pot. Water the plant weekly during the growing season and once monthly with a foliar fertiliser mixed at half strength. Growing season is spring until late fall. Keep it in a humid area with plenty of indirect light. 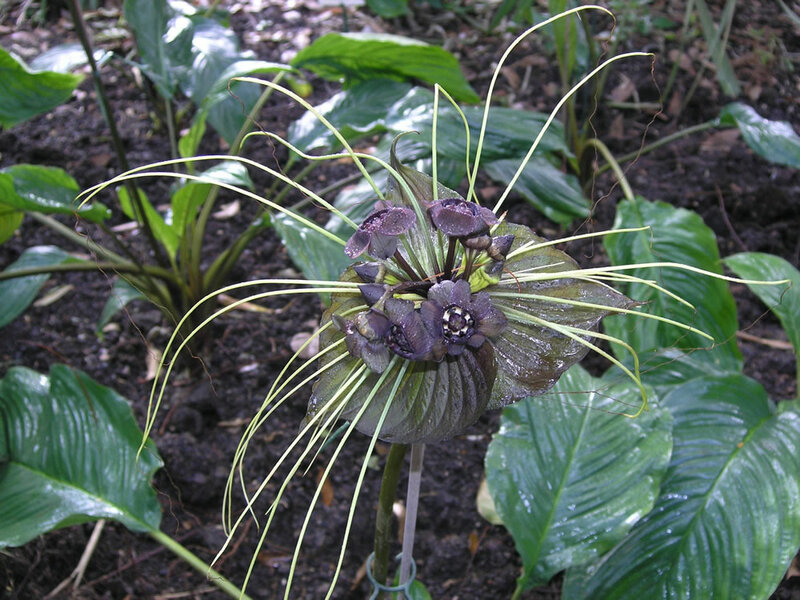 Tacca chantrieri can be propagated from seed. Once the seed ponds dry out or fall, remove and split them open to remove the seeds. Let the seeds dry only a few days before sowing them. When they split along their sides, numerous 0.5cm (0.25 inch) seeds are revealed embedded in a sticky pulp. The seeds should be cleaned of the pulp and air dried. After that, soak the Tacca Chantrieri seeds 24 hours in warm/hot water. Use a thermos bottle to keep the water hot during this time. Sow at 1.5mm (1/16 inch) deep in trays or pots, using a good, moist, seed starting mix in a propagator or warm place to maintain optimum temperature of 27-30°C (81-86°F). It is essential that the soil temperature is high and kept steady. Germination usually takes 1-9 months. The seedlings benefit from frequent dilute applications of soluble fertiliser. When small, they pass through a stage of almost chronic chlorosis, even with regular fertilisation, but overcome this in a few weeks. Transplant the seedlings when they are large enough to handle into 8cm (3 inch) pots of a recommended potting mixture for mature Tacca chantrieri. During the growing season (late spring to late summer) the plants will need to be watered very regularly and the compost must be well drained. Pot on as required into 10cm (5 inch) and finally 25cm (10 inch) pots. 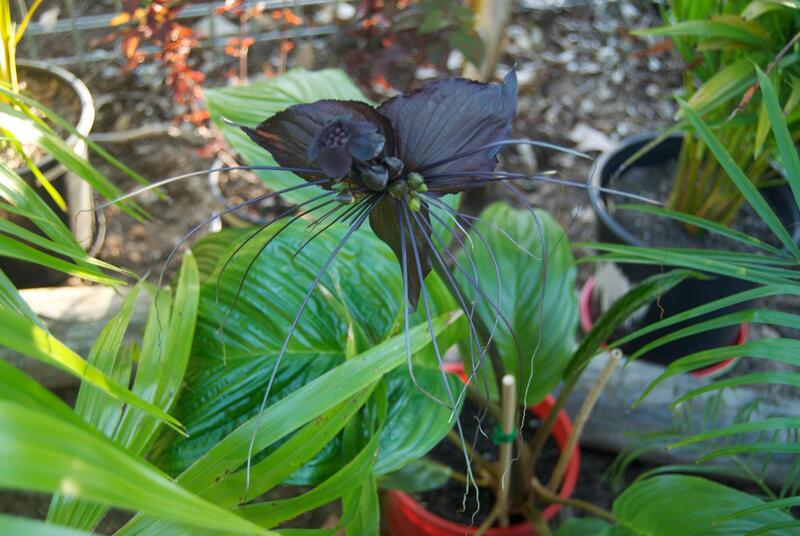 Furthermore treat the plants as mature Tacca chantrieri. The plants will reach flowering size in about two to three years. Problems: Bat flower seems to be mostly pest and disease free. Soil borne disease is common. To minimize problems, keep soil moist not wet and provide air circulation. Slugs and snails do occasionally bother these plants. The plant needs more humidity if leaves start to brown, grow crinkled or lay down rather than standing upright. Treatment: A good idea is to take the plant in bathroom, turn on the hot shower and let the room steam up. Close the door and leave the light on overnight. This will perk up a Tacca chantrieri quicker than anything else. They love the moisture and heat. Furthermore, find a place with better humidity or choose grouping the plants to rise the humidity. Sometimes, with out warning, Tacca chantrieri can go dormant and play dead in less than ideal conditions. It is a tender semi-evergreen perennial. It is evergreen in warm moist climates, but goes dormant where seasonally cool or dry conditions prevail. Treatment: Treat the plant as mentioned for resting period. Water the plant just to prevent the potting mixture from drying out and stop fertilising. Often they will start making new leaves in an few months when the conditions are improved. Tacca chantrieri new leaf that grew turned black and died. This may happen because Tacca chantrieri plants are highly sensitive to dry air to too much direct light. Another factor may be that the plant is getting chilled or heat-scorched from being too close to the glass. Treatment: Change their location with one where the plant can receive better conditions. Do not place the plant too close by the window glass. Note: Tacca chantrieri is a tender, long-lived semi-evergreen rhizomatous perennial. It is evergreen in warm moist climates, but goes dormant where seasonally cool or dry conditions prevail. These plants will have a dormancy period when they grow in warm environments too, but they will not loose their foliage and just stop growing and producing flowers. When they are grown in cool environments, the plants will loose their leaves, resuming all vital aspects into their underground rhizomes. After the rest period, when environment condition are optimal the plants will restart their growth from their rhizomes. The plant flowers usually after it has produced three or four full sized leaves. Another unexpected surprise regarding Tacca chantrieri is its capability of self-pollination despite the fact that in nature they look like being pollinated by flies. Tacca chantrieri is a magnificent plant which mimic the orchid flower, making place for confusions. The two plants may share the love for humidity, shade, same soil preference, they may have both unusual flowers, but Tacca chantrieri is not an orchid. Uses and display: Tacca chantrieri are grown mainly for their flowers, which typically emerge during the warmest months of the year and then will produce up to 8 long lasting flowers over the course of a single season. The flowers should be left on the plants — they do not survive in a vase for long and cannot really be used as cut flowers, but there are voices which classify these flowers being suitable for vase. It makes a peculiar and unique plant for a massed shady groundcover or a container. They also make an amazing display as tropical houseplant. It makes a great container plant and is a real conversation piece.